Giving a gift is certainly one of life’s win-win moments. In giving, we prepare our gifts with care and anticipation. In receiving, we are both delighted and humbled by the expression of gratitude, love or care for us. When giving a gift two sentiments still hold true. It is better to give than receive and it really is the thought that counts. Tea parties give us an excuse to be a giver in the preparation of a small favor for our guests. It certainly isn’t necessary or expected…just a tradition we enjoy. Perhaps you feel the same way. And since gifting can be expensive, especially for a large tea party, we thought to share our ever expanding list of thrifty, nifty tea party favors! These are great for wedding and baby showers as well. Feel free to share your own ideas. DISCLAIMER: One of our favorite stores for inexpensive favors is AsianIdeas.com. You’ll see links below for some of the gifts we’ve discovered. However, we are not affiliated with this store and recommend shopping at your own risk. Links are for information only. 2. A See’s Candy chocolate! If you live near a See’s store, you can purchase individual chocolates and boxes to fit just one piece. Last we checked, the cost was under $2.50 for a truffle with the box. 14. Crystal Cut Flower Pot in Box – Beautiful! The University of Phoenix Arts has a blog entry by Brianna Davis called Get Crafty With These 20 DIY Party Favors. It includes good ideas for weddings, kid’s parties and showers. Our favorite is #8 Cupcake in a Jar. We can definitely see some possibilities for tea parties. We hope you enjoy these resources. May your creativity be inspired! We invite you to visit Teapots ‘n More and browse our current selection of tea accessories and sugars as well as new bone china teapots, tea sets and other delights. With great empathy, we’ve watched the news from Japan this week along with all of you. Our hearts break for the stories of loss and alternately rejoice through tears for every life saved, every act of courage and bravery. In the face of such destruction, it is easy to feel small and insignificant. However, these are the times that require our action and affirmation of all that is good in each of us. So, what can you do? Well, what are you good at? Are you a good organizer? Are you a good baker? Do you love to decorate? Do you know a lot of people? Do you love a good party? Perhaps a tea party? If you’re answer is yes, we suggest a Charity Tea. It doesn’t have to be anything fancy. Just send out invites and plan a tea as you normally would with one small change. Ask your guests to bring a donation of any amount, large or small. You’ll be surprised at how your little bit can add up when you put it all together. Below are some ideas to spark your imagination and philanthropy! 1. Who should we give to? If you are seeking to help the Japanese people, American Red Cross and Samaritan’s Purse are a few good suggestions. These organizations are already in the country with people and delivery systems in place. Other possibilities are a local children’s hospital, food bank, cancer society or disabled veteran’s group. Just look around or ask your guests for suggestions and pull one out of a tea cup during your tea party. 2. If your tea is small enough, total up your donation while your guests are present so everyone can share in the accomplishment. Otherwise, be sure to send out a donation total with your thank you notes. 3. To accompany your donation, write a short letter or card together with your guests and have everybody sign it. 4. Give your guests a remembrance of the day such as a Japanese fan, nice chopsticks, bamboo coasters or a pretty candle. 5. Make it fun. Share good food & good company for a good cause. You’ll be glad you did! This week, we acquired a lovely old estate tea cup for our vintage and antique collection. It is old porcelain with no mark and completely handpainted. A beauty! The only historical clue is an old sticker on the bottom of the saucer which says “Aunt Claire”…apparently the former owner. When I hold these old tea cups, particularly the ones with a little character, a romantic notion strikes me. What have they seen? What joys celebrated? What sorrows comforted? What frustrations soothed? What would they say if they could talk? Collecting tea cups, or anything vintage, is always an adventure. Sometimes you’ll find a bit of history or a rare treasure. Other times, you’ll find a common piece that you really love. With tea cups, there are so many to choose from at flea markets, estate sales, antique shops, garage sales and online. In fact, the choice on ebay alone is staggering! So, how do you determine what to collect? Some people collect tea cups made in specific regions such as England, Japan or Europe. Others collect specific manufactures such as Royal Winton, Lefton, Satsuma or Limoges. You can collect certain patterns or types such as Geisha Girl porcelain, Blue Willow, Royal Winton Julia Chintz, or Limoges hand painted designs. However, most collectors choose tea cups they love. We believe this is the best way to collect and offer the following simple guidelines for your consideration. 1. First and most important, choose what you really love and will still enjoy 10-20 years from now. 2. Don’t collect for value or profit. Tea cups or anything vintage are like fine art. It will only be as valuable as the consumer demand for it. A tea cup purchased for little money may never be worth much except to you or it may someday be valuable to collectors. Conversely, a tea cup in high demand and highly priced may eventually lose value if the demand for it goes down. So again, whether vintage or new, buy what you love. For information on Wileman Shelley China, visit our posting The Wileman Shelley Potteries: A Brief History. We invite you to visit Teapots ‘n More and browse our current selection of vintage & antique tea cups as well as new bone china teapots, tea sets and other delights. A yummy, inexpensive substitute for Clotted Cream or Devonshire Cream! 1. In an electric mixer, beat cream cheese at medium speed until creamy. Add powdered sugar and butter flavoring and beat well. 2. Gradually add the heavy whipping cream and continue beating until solid peaks form. Do not overbeat or cream will separate. 3. Handle gently and as little as possible. Turn gently into a plastic container, seal tightly and refrigerate until use. Will keep in the refrigerator for 5 days. 4. 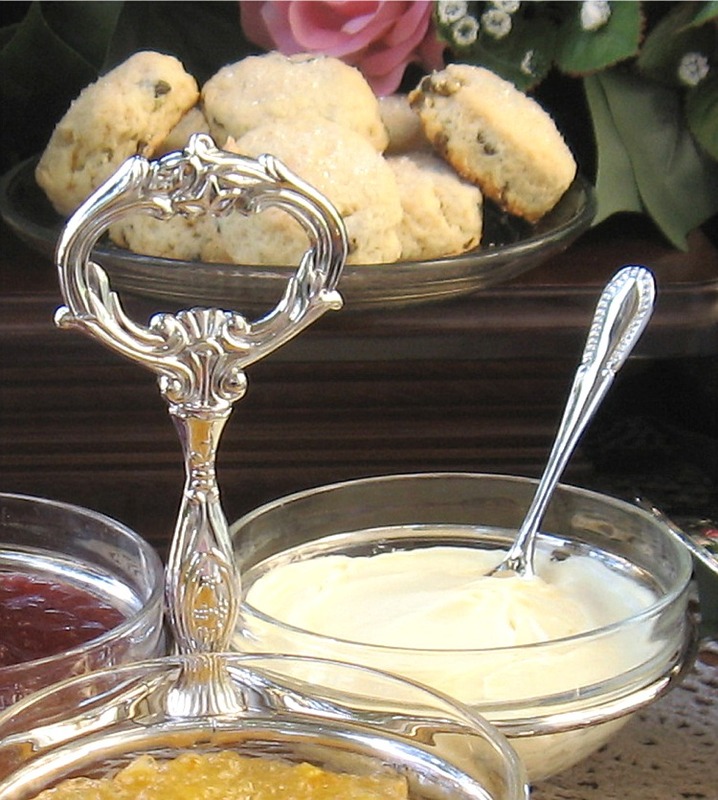 On the day of your tea party, transfer mock clotted cream to your serving bowls. 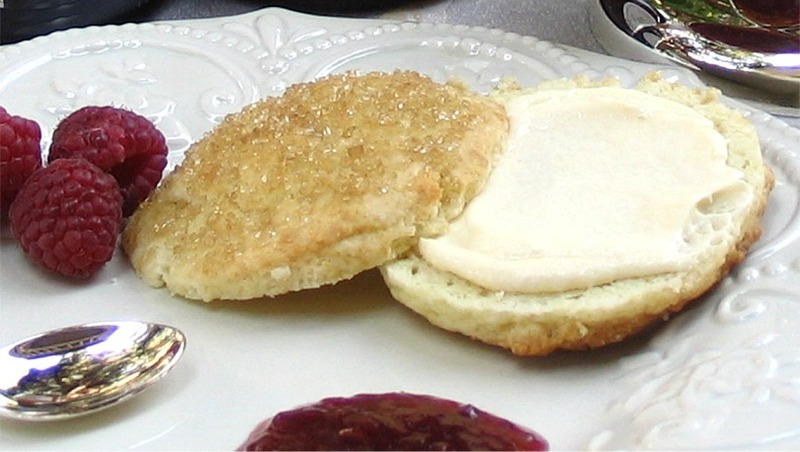 Cover and keep refrigerated until you are ready to serve with the scones. This cream will separate if it sits on the table too long, so be sure to keep cold until used. Tip: Butter flavoring can be found in the baking aisle of grocery stores, near extracts or from cake decorating supply stores such as Wilton Cake Supplies. Gift Idea: Consider giving this recipe on a cute store bought or handmade recipe card as an inexpensive, but much appreciated, party favor! You’re invited to click Teapots ‘n More and browse our latest selection of teapots, tea accessories, tea spices, tea miniatures and elegant tea sets.